“To travel is to live” H. C Andersen once wrote. And one can only agree with him. To travel is the opportunity to experience new things, feel, see, hear, smell and taste something different, than what you are used to. And this is the very charm of it. 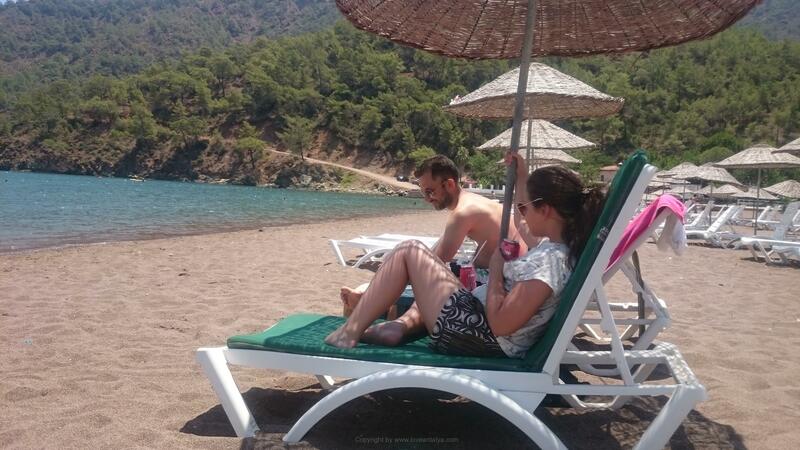 Maybe you are used to travel (hopefully it will never be a habit) and perhaps you are even used to go to Antalya? I have come there for more than 17 years, but admitted – some things are running a little on the routine. But a habit – never. There is always something new to see and experience. Sometimes you just have to see it. Therefore I’ll give you 9 suggestions for cozy (and beautiful) trips out of town. There is something for all senses – including taste, if you either buy some food – or even better, bring a picnic basket with you. ¤ First of all, I think that Manavgat is worth a drive. This beautiful wide waterfall with the most absurd blue color, is like a cool oasis in the middle of the countryside and is simply in a league of its own (and then there is just something with waterfalls, when the sun thunders down with 40+ degrees) . I’ve been there several times, but I never really get tired of it. Yes, there is more and more “touristy”, now with an entire park, which is almost built around selling to or feeding the many tourists who. That can be a little tiring. But if you take the waterfall as a waterfall, then it is quite a beautiful experience. 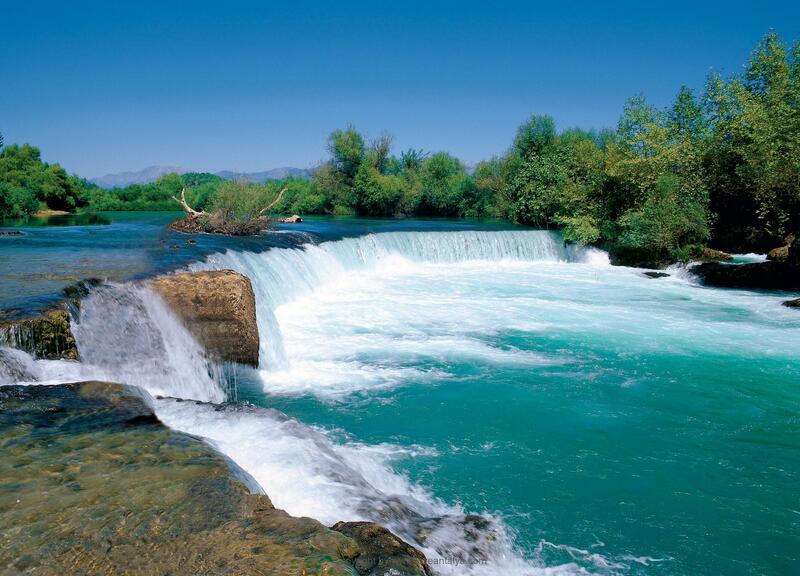 Manavgat is also a great attraction for many local and domestic tourists. And if they travel to it in their own country, yes .. it is not only plastics and boosters tourist nonsense. 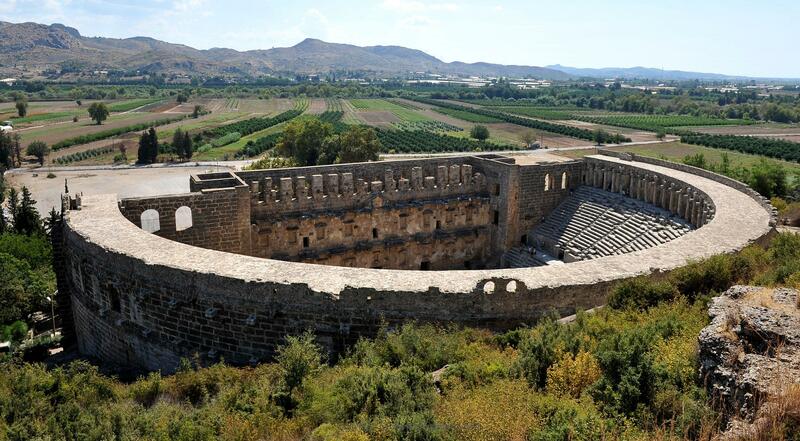 ¤ On the way to Manavgat you can also just add a visit to Aspendos Theater. This beautiful, majestic giant, towering up in the countryside and takes you back in time, where the impressive amphi-theaters was quite common. While there are a number of old theaters around Antalya, this remains the most impressive one and you have to choose if you do not bother to see so that many. You can not help being just a bit impressed. Read more about Aspendos here. ¤ On the other side of town – to the west, there is also situated a lot of attractions. One of the most fascinating is certainly Olympos – the burning mountain. Of course the mountain itself isn’t burning. It burns from the many small cracks in the mountain, where gas seeps up. It’s a pretty tough hike up the mountain (and really hard if you do it mid-day in the summer), start early or late in the day instead. If you take the tour towards the evening you will be rewarded with the most beautiful sunset you can imagine – surrounded by the mythical flames from the mountain. That’s really something to remember. ¤ Adrasan is a place I would recommend everyone to experience – it is really quite unique and a place where time just stands still. One can by no means be stressed, when you are here (or else you will quickly relax). Perfect for a holiday. You can and should not do much here. Just enjoy the weather, the astonishingly good cafes and perhaps hire a boat to take you for a ride out on the water. You will not find a more beautiful place for miles. I have previously written about my dreams of Adrasan. ¤ not far from Adrasan – on the road to Antalya, you almost must try one of the beautiful River cafees, located in the middle of the river, on the way down the mountain. 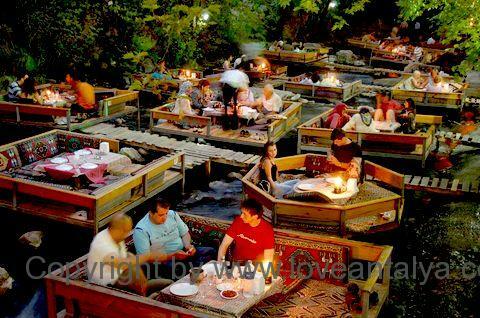 In summer there is admittedly not quite as much water in the river, but the cafes are beautiful and the food is really good. You will get a whole new culinary experience, especially if you are used to the hotels’ all-inclusive. I described one of our visits in Ulupinar here. ¤ Phaselis, oh … Phaselis. 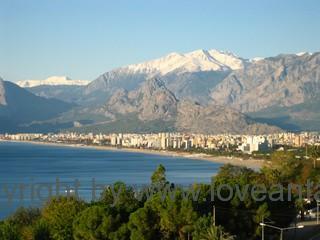 besides Adrasan this is one of my favorite places in Antalya. I come here again and again, almost every year. I really love the primitive and beautiful place mixed with history, water and nature. We have played many pirate games here since the kids were small, explored the ruins, eaten picnic under the pines and hunted squid and fish in the sea. Phaselis is for me the epitome of good time, vacation and family time. 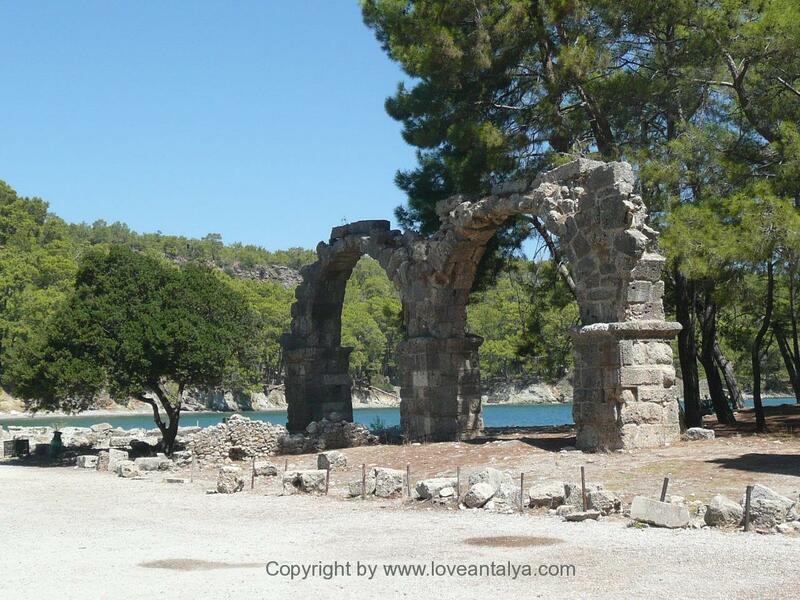 In fact, Phaselis was the first place I wrote about, when I started this blog. Hard to burn inside with a good recommendation. ¤ There must also be room for a real stalactite cave – there is a lot of them around in the mountains. 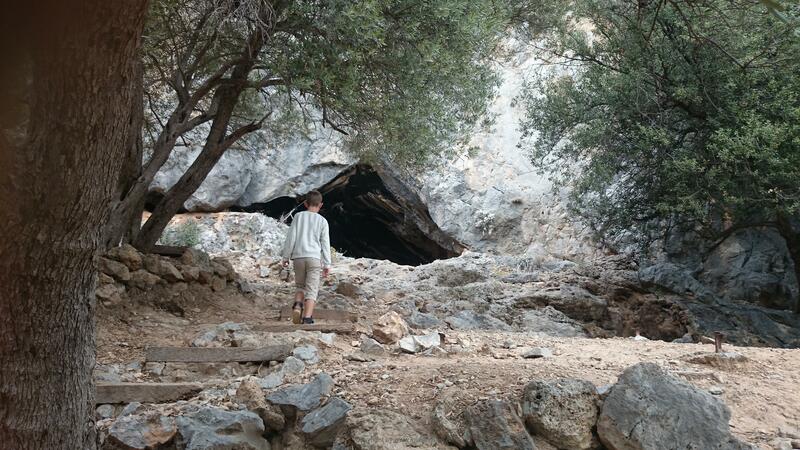 We found an approximately 20 km north of Antalya – the Karain Cave. It was quite impressive and large. Although it was a completely officially place, they were apparently not used to see tourists – they looked with big eyes, when we suddenly came with our small car. I have not yet written about the place, but I promise soon to do so. ¤ Saklikent is not only for ski enthusiasts. It is also a place where you can go in the summer and enjoy the beautiful mountain scenery – not to talk about the irresistible views. Now if you want to go skiing, they are open from November to start May – you can read more about Saklikent here. ¤ Attractions (or rather experiences) or trips out of town should also include a trip by boat. Either one of those short trips for a few hours – or one of those little longer, which can last anywhere from a half day to several days. Either way it is a wonderful experience (but steer clear of boats with high “yalla-yalla”- music – they can all be quite tedious and enervating in length). Many of the tours you can find by taking down to the harbor and just choose a boat. It cannot be easier. If you really like sailing, you can order a whole boat-vacation. That I also have to write about. 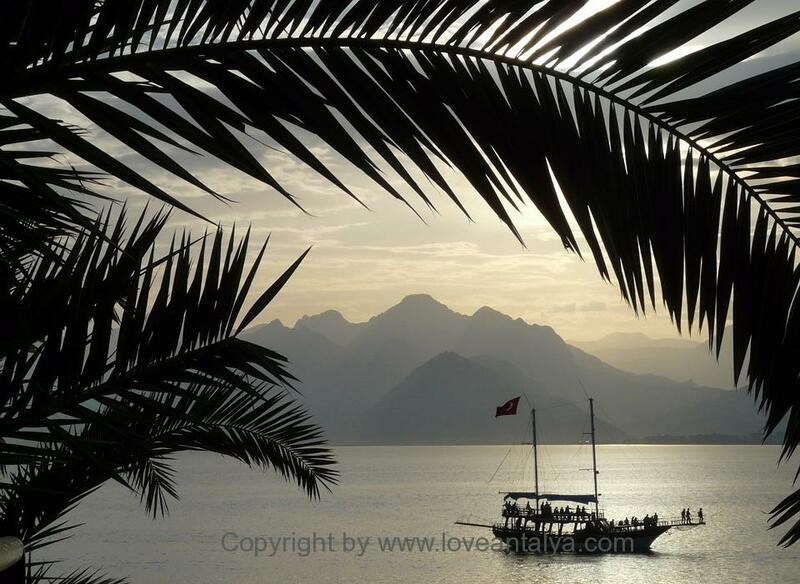 But remember – Antalya is best seen (and are most beautiful) from the water – so treat yourself with a trip. Of course, many things is much easier, if you have rented a car for your holiday and want to drive around. So the possibilities are virtually endless. Taxi provides itself – it’s even easier (but also more expensive depending on where to go). However, you can also get very far with taking one of the public buses – it’s a fun and authentic way to travel (and an experience you probably will remember). Finally, the hotels often arrange trips to the most famous sights (or can assist in arranging your transport to a specific place as such. Adrasan). The opportunities are certainly many, so do not let you hinder. All sites in this article is max. 1½ hours drive from Antalya. Remember – To travel is to live! Love Phaselis too! Stunning place, even in the winter!